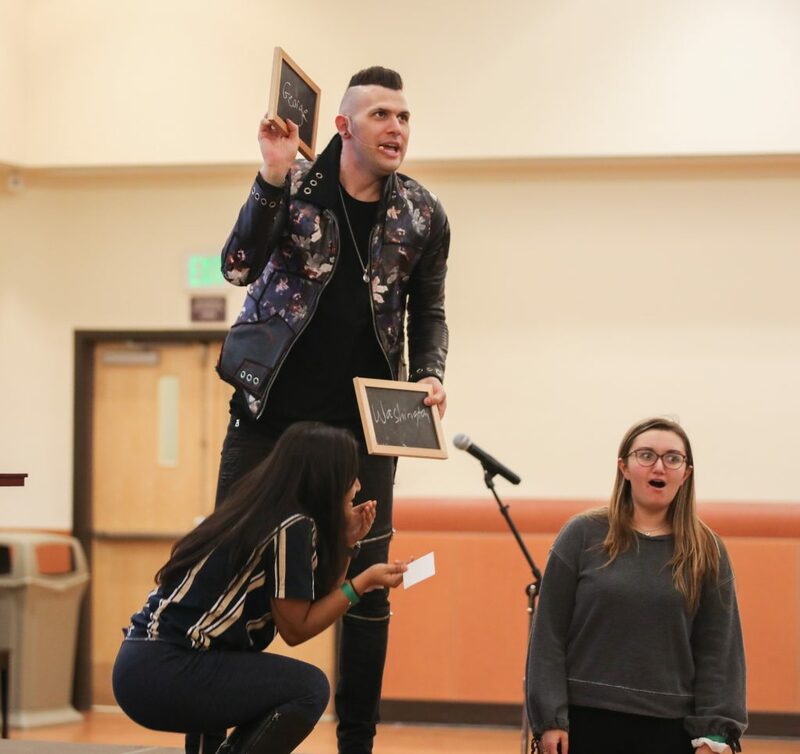 Rose Coschignano/Pipe Dream Photographer Comedy magician Joel Meyers performed for students at Late Nite on Thursday, Jan. 24. “To kick things off tonight, I’m going to do something stupid. Is that cool?” Joel Meyers asked the crowed to start off his show. By the cheers from the crowd, something stupid was exactly what the students needed. The show started off with some mediocre tricks, such as crushing a plastic bag with a bottle in it and finding a card an audience member picked from a crowd. As the show went on, the tricks escalated and got more dangerous. At one point, he had two audience members strap him into a straitjacket that he struggled his way out of in under two minutes, which he did as an homage to the famous escape artist Harry Houdini. His next trick, which he described as “the most dangerous trick you would ever see on a stage,” involved a game of Russian roulette, where he smashed his hand into a series of randomly placed paper bags, one of which had a 6-inch spike in it that, if smashed, would go straight through his hand. Madeleine MacLean, a freshman majoring in political science, said she was stressed watching that trick because before he performed it, Meyers played a video compilation of people performing it, all ending with the spike going through their hands. Luckily, for his and the audience’s sake, Meyers managed to avoid the bag with the spike while being blindfolded and having an audience member, who didn’t know which bag had the spike in it, wave his hand over the bag she wanted him to smash. During one of his final tricks, Meyers staged a seance. Jannatul Naima, a freshman majoring in biology, volunteered for it and was told to think about someone she was close to. Then, Meyers told her to pick a card out of a pile that had the names of dead celebrities, who he was going to contact to find out who she was thinking about. Naima chose to think about her brother, whose initials were S.S. and the dead celebrity on her card was George Washington. Then, she and Meyers placed their hands on a table that slowly rose and flew over the letter S laid out on stage, lowering itself twice to indicate that letter was both initials. Katie Isgro, a freshman majoring in human development, was the second volunteer for this trick. Isgro was told to stand offstage with two blank chalkboards and a piece of chalk between them. Meyers said that the spirit of the dead celebrity would write its name in it. At the end of the seance, George Washington’s name was written.